The Ford F-150 pickup can haul more cargo and tow a heavier trailer than any of its competitors. And with a fully boxed frame, the F-150 has the strongest chassis in its class. Engineered and tested to withstand more punishment than your most difficult tasks, the F-150 is Built Ford Tough to come through with the dependability you expect in this full-size pickup. The current F-150 does come in a host of cab, bed, powertrain, and suspension variations; there are three cab configurations with multiple wheelbases and box lengths each, providing choices to satisfy just about any trucker's need with the F-150. 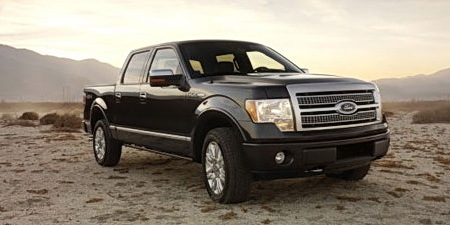 Properly outfitted, the F-150 can tow 10,700 pounds--while earning five-star frontal crash-test scores. A choice of V-8 engines comes with either four- or six-speed automatic transmissions, but no V-6 engine option is offered. Great pulling a trailer. easy to hook up trailer lighting package. Interior sound quality is fantastic. Excellent on the fly shift to 4x4. Works good in the field and off road. Front FOG light are not with a poop!! I purchased aux for lamps to enhance getting more light on the roadway. Seat belt alarm system a pain. Cant shut off system so that when useing the vehicle on the farm getting in and out of the vehicle alot seat belt alarm annoying. Door locks lock all doors at one time and when vehicle in gear all doors lock automatically. They cannot be changed either.. In 4x4 the turning radias is slightly restricted. This truck has really stepped up to the plate and delivered for me. I pull farm wagons with it then take the family out for and evening. Long trips are a breeze and the comfort level of the seating front and back is really wonderful. Pulled a trailer back from Indiana to Florida with it and the 4x4 worked wonderfully in the winter snows of Indiana Interior cab has really nice features that appeal to the wife. Seems to be very reliable on and off road. I have always been a Toyota guy , but I felt compelled to really give an American truck a serious look.I drove them all and I am 100% happy with my decision to buy FORD.I know it's still new(with only 6500 miles on it) and really have not put it through the Marine Corps test yet. I am sure it will stand up to the standards demanded of a Ford truck. Bought the truck used with 97K, Was suprised at the ride and the pick up over my chevy with a 350(loved), the 5.4 has plenty of power and mine has the 7700gvr package. Added exhaust, cold air intake and new performance plugs and what a differance. The truck has ben great so far. The only problem is a exhaust tick comming from the right side when the engine is cold but other than that I do believe that i am a ford fan now. Was always a chevy man until I drove this truck. Rides better than any chevy And the interior is of nicer quality. I have a fully loaded f150 super crew with the 5.4. mine has the max towing capcity for that year(7700). Test drove the truck cause I was sick of working on my chevy once a month. My dad's company has used this stle truck since it was introduced. They have truely been great. Of the three two have over 150,000 miles and have yet to ever have been in the shop. The third one has had trouble however. I have loved the truck for the most part. Great truck for pulling and highway riding. We had the 4.6L V8 which tends to be weak but still gets the job done. Twin I beams up front, 300 cid inline six, best Ford pickup platform ever. 16 consecutive years without needing anything for inspection. lasts forever, and has better low end torque than my 1996 460cid (7.5L). Hauls 3,0000 lbs of gravel (extra leaf spring added in 1992) occasionally without changing performance. Overall truck durability is enhanced with the inline six because you don't have to wind up the engine or and snap the clutch to get things moving. Give it needed maintenance and it more than pays for itself. it stays still when its parked. from the first day nothing but problems. alignment, steering, shocks, transmission, 4x4, the whole front end, dash shaking extermly bad, heater core. the list goes on forever. Even though my truck is a F-150...its the best of the best. Body kit, Supercharger, the works. This truck is a one of kind. This is my husbands truck. We have made modifications to the truck. Showed it in several shows and taken home a good bit of money. Swade and leather seats, green gages, and heads up display. Modifications include: Pully system, 2 10' Rockford fosgate punch 3's, with a 800 watt amp, dvd/cd player with 3 7' flip down screens, green interior lights at feet and in middle of the bunch seats, underglow under the truck and underglow in the bed of the truck all green, Gaylord cover with wing on the back. Led backlights, 20' Crome rims, Angel eye headlights with clear corner lenses. Its a puller! Nice looking, fit and finish is great. Last of the great styled bodies. Why did they change the body style on the new ones??? Looks terrible. Only thing I have noticed is the "check engine" light is temperamental. Comes on when all you need is a little injector cleaner. Oh well - I can live with that. Overall the absolute best truck I have ever owned. Had a Dodge 1500 that went through 3 transmissions in 64K. This F150 Supercrew is awesome!! Just went over 100,000, and has never been in the shop. I pull my 5,000lb camper all over the western U.S., with never a whine from this truck. The engine/transmission combination is just right. No lack of power here. When the engine in this one decides the party is over - I will be replacing the engine and keeping the truck! Very smooth car like ride, attractive design, plently of passenger room, and the engine is layed out conviently for easy maintenance. Truck is way too long and wide for parking. Poor turning radius compounds the problem. Poor gas mileage. Interior fixtures will not stand the test of time. Very poor rear window visibilty as Ford has chopped from previous model. I also own a 2003 Expedition and like the 150 have experienced similar problems. Anyone considering buying this vechile should think twice. The moment the warranty expired many things went south. Power steering went out. Which is very odd for a truck with less than 40,000 miles. All of the power window motors went out. The leather wears terribly. The leather wrapped steering wheel is falling apart. Metal is easily dented and very expensive to fix. The truck is so wide that when washing you must have a step ladder to hit all spots. The turning radius is the worst of any car I have owned. The only people who should consider this truck are people requiring 4WD and living in rural areas. Gas mileage is horrible. The dealership said I would get 18 mpg but am getting about 13 on the hwy.